Prepared by Ian Smith, This page created 9th October 2000, updated 10th February 2009. Best on 800*600. 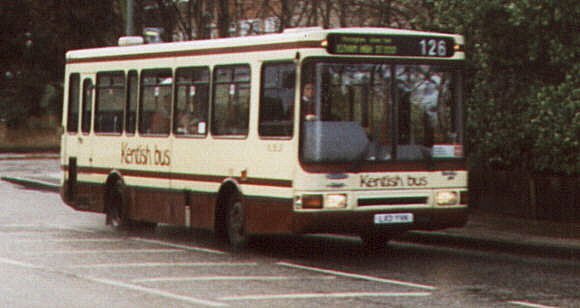 Kentish Bus made an impact with its fleet of 48 Darts in early 1994, winning various contracts from London Buses in south-east London. 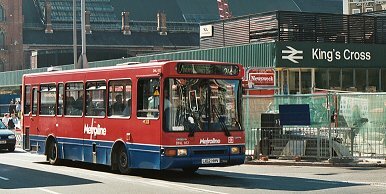 They went over the Thames on the 42, went under it on the 108, invaded suburban Bromley on the 126 and 162, and served renewing Thameside on the 225 and 286. They were nicely presented in a maroon and pale primrose livery, that really stood out on the traditionally red-bus routes that they served. 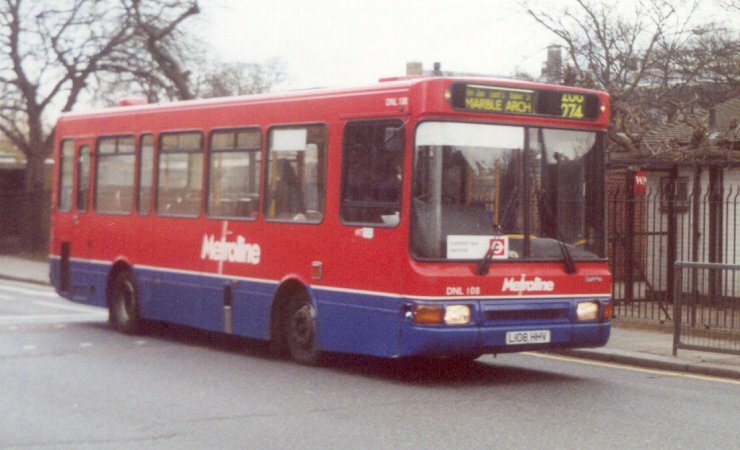 Initially most went to an operating base at Lewisham, but Kentish Bus then moved some to a base in Leyton, and then took over the redundant Ash Grove garage, which it called Cambridge Heath. The buses for the 42 went there. Kentish Bus 113 swishes through the rain on a dark October day in 1997, on a 126 from Bromley towards Eltham along Burnt Ash Lane. Their success on these routes could not isolate them from the pressures of the subsequent tender rounds, and all these routes were lost to other operators, with the exception of the 126. The buses found other work, replacing midibuses, in operations further out from London. Lewisham lost much of its work in 1996, and many of the Paladins were transferred to either Dartford or Dunton Green. Cambridge Heath garage closed in February 1998, and the Paladins there went to Arriva London North-East (Grey Green) for the 225. These then moved on to Arriva London North at Enfield, for the 192. 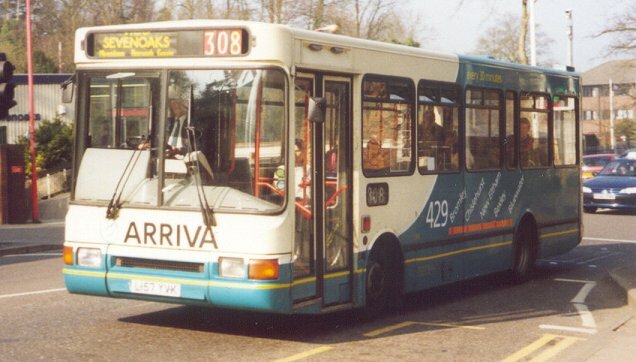 Four found work on a new route connecting Bromley to the shopping pit at Bluewater, the 429, for which they received Arriva turquoise and route branding. 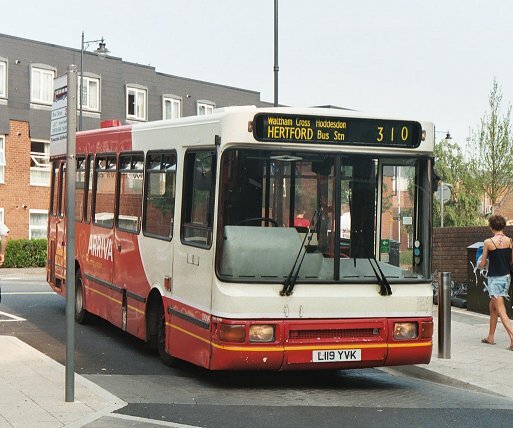 Their success inevitably meant that they were replaced by larger buses on the 429 and its successor the X29, and went to Dartford for more mundane duties. 3157 is branded for the 429, but in March 2000 finds itself astray on the 308 at Sevenoaks. It shows the red blinds used by some buses, and also a different depth of scoop from the standard 126 vehicles. Meanwhile those on the 126 were keeping busy, and lost their smart early livery, succumbing to the turqoise and champagne "scoop" livery. Why some of them have red backgrounds to the route number blinds I don't know. (Perhaps someone can enlighten me?). This came to an end in March 2001, when the 126 received new dual-door Dart SLFs, and the earlier Darts were dispersed to other duties. Some went very briefly to Crawley, before that garage was sold to Metrobus. 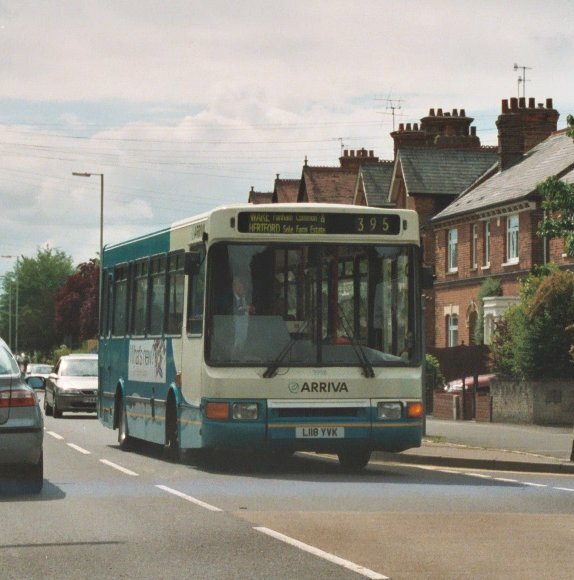 Arriva turquoise adorns 3159 and 3152 as they follow each other along Widmore Road in Bromley in March 2000. 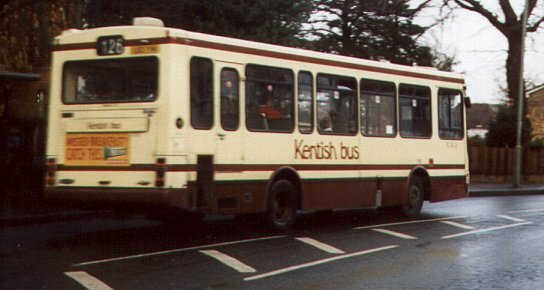 When Kentish Bus lost the 42 to Limebourne, and the 108 to Harris Bus in April 1997 120-126 and 151 were transferred to Londonlinks at Croydon to displace MetroRiders on the 407. There they were classified DS (Dennis Singledecker?). A couple later went to Arriva Guildford & West Surrey at Woking, for a while. Beddington Farm depot was transferred to Arriva London South in October 1997, and the Darts moved with it. 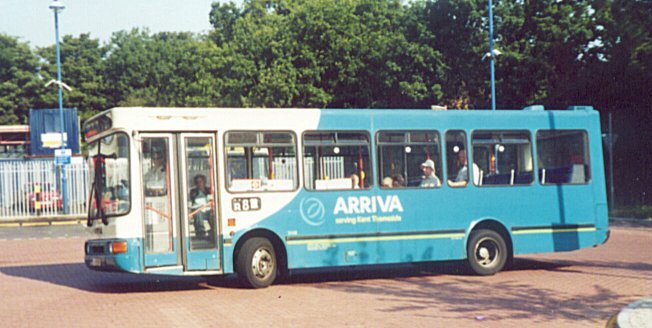 September 1998 saw 115-9 transferred to Arriva London North, for use on the 225. They were reclassified DRN and acquired red "ice-cream scoop" livery. The 225 then passed to Stagecoach Selkent on retendering, and these five went to Enfield for service on the 192. 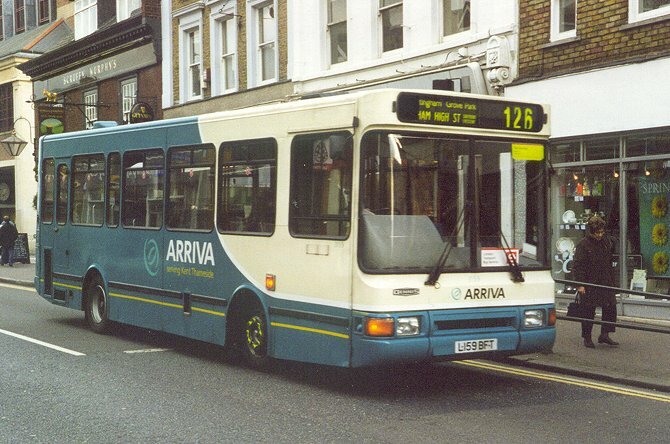 Two more (122 and 124) went north to join them at Enfield from Arriva London South in February 2000. 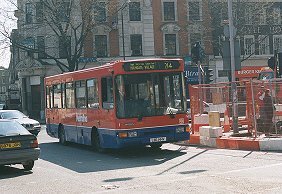 January 2003 saw the DRNs being displaced by new low-floor buses at Enfield. 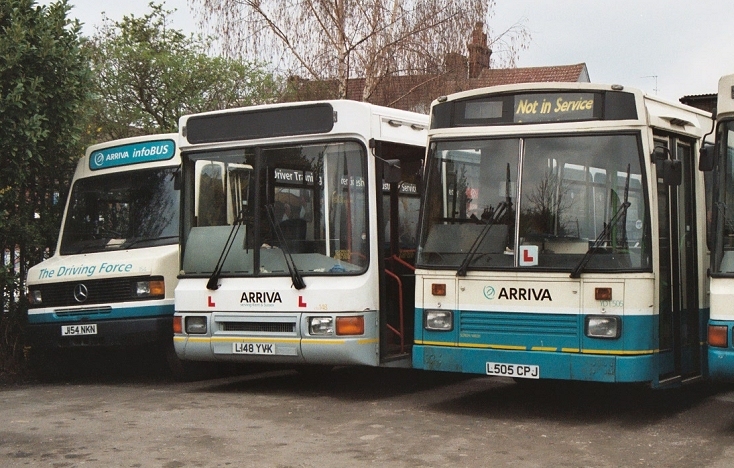 DRN 118, 119 and 122 went to store at Beddington Farm, soon followed by DRN124. 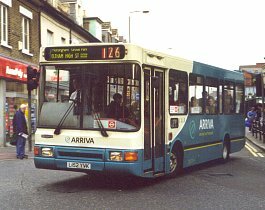 In spring 2003 London Transit in Hertford ceased operating several routes, and Arriva the Shires moved to provide replacement services. 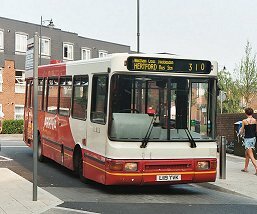 Three extra buses were needed at Ware, and these took the form of loaned DRNs 118, 119 and 124, still in red / deep scoop livery. They soon began to appear on the 310 between Hertford and Enfield. The demise of Buzz at Harlow in March meant further demands on Arriva the Shires, and some of the DRNs appeared there briefly in April, before settling on the 310/351/354 from Ware. Meanwhile DRN115 went south to work on the 455 from Beddington Farm. and DRN116 moved to Edmonton. In July 2003 Arriva the Shires formally took over its three loaned DRNs and gave them new numbers (3398, 3399 and 3334). Then it loaned 118 (oops, 3398), to Beddington Farm for the rest of the summer, in exchange for LDR7. 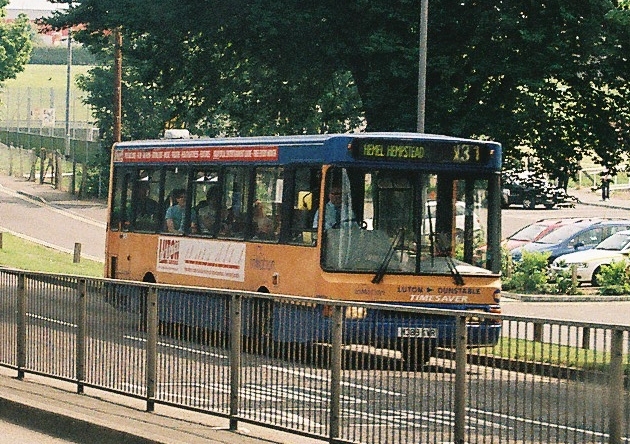 The other two began to appear regularly on the 331. 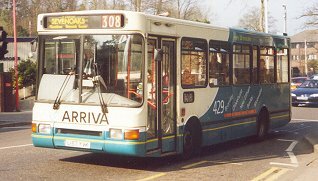 3398, ex DRN118, now in Arriva turquoise and cream, on the 395 to Ware, Hertford, in June 2005. Beddington Farm had a shortage of short Darts during summer 2003. So DRN 115 was transferred from Enfield, DRN122 was resurrected from the dump and repainted (!) 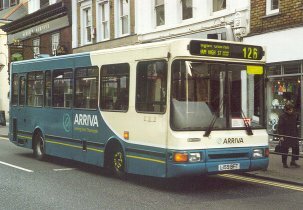 and DRN118 was borrowed from Arriva the Shires, for use on the 455. DRN 116 was pulled south from Edmonton in October. But once Beddington Farm's delivery of new low-floor DAFs happened in November DRN 115 and 122 were despatched to the storage site on Tottenham Marshes. 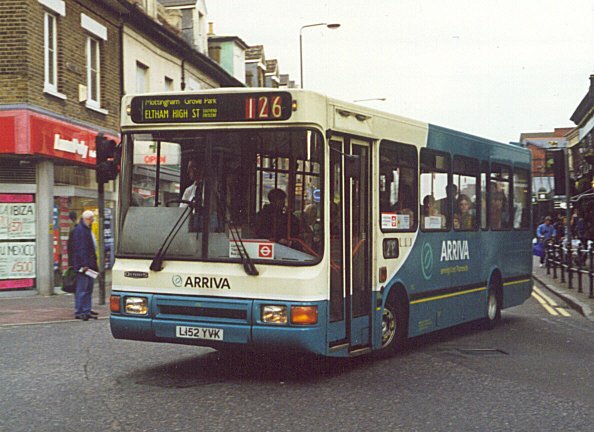 Also in February 2000 121 and 123 went to Arriva London North-East at Edmonton. 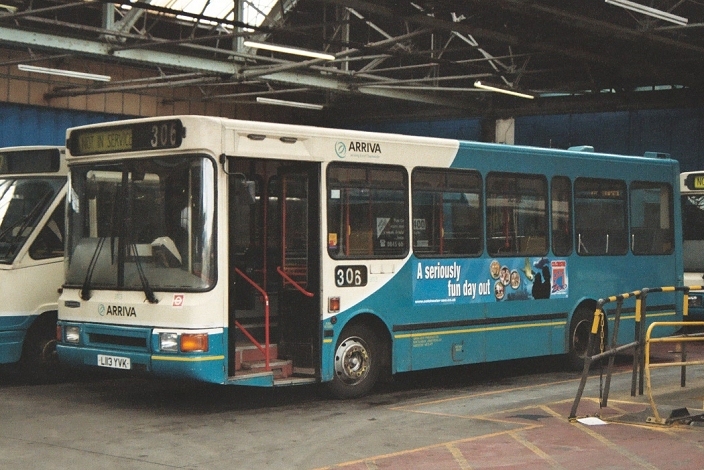 123 subsequently went further north to Arriva North-West, following 120, 125 and 126 which had gone to Bootle in June 2000. Others have oscillated back and forth between Kentish Bus and Maidstone & District (Arriva Kent Thameside and Arriva Kent & Sussex/Medway Towns) as contracts have changed. They are versatile buses, and have filled several niches, seldom being short of a job. Although now not acceptable for TfL work, some still appear on Northfleet's "country" routes. 3148 is at Orpington Station on Roundabout Route R8 in September 2000.
but it would seem to be able to meet the tilt test requirements. 3148 later became a dedicated trainer. Wearing training uniform of white blouse and grey skirt, it takes a Sunday rest in Northfleet garage yard in March 2004. Meanwhile 3113 was still in service at Northfleet, and on the same date is seen resting in the garage after a stint on the 306. 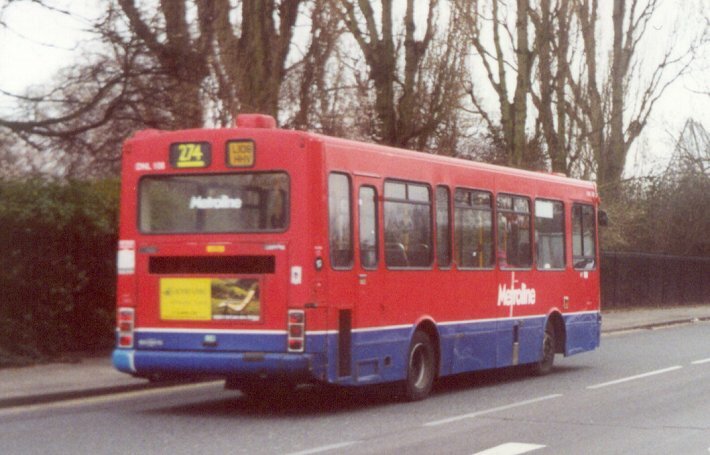 London Buses bought nineteen 9.0m Darts with the Northern Counties Paladin body in June 1994. The nineteen buses went to Holloway (HT) for use mainly on the C2, for which all except DNL118 and DNL119 received route-branding. They looked really smart with their white roofs and grey skirts, and were a large improvement compared with the StarRiders that they replaced. In October 1994 they were privatised to MTL London Northern, and stayed at Holloway. 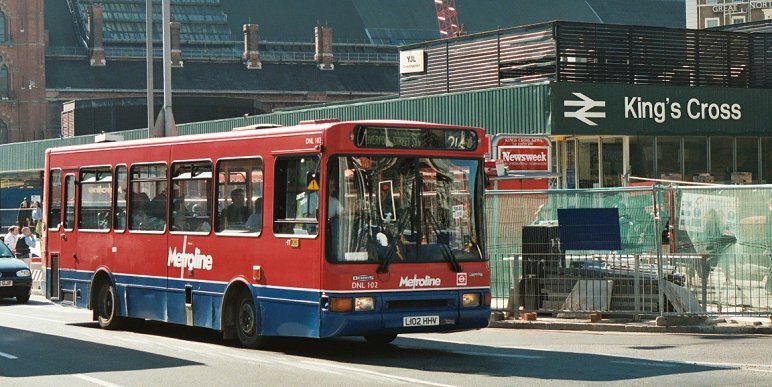 Metroline took over in 1998, and they have received Metroline red and blue livery. They have been used on the 274. New buses on the C2 have seen them join the Dart pool on the 214 and 46. DNL108 on the 274, passing London Zoo on a dull February day in 2001, wearing Metroline red and blue. DNLs for a while joined the 214 gang, so I saw them at Kings Cross. 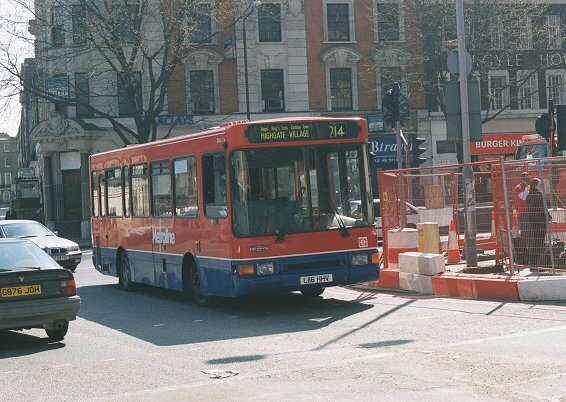 DNL116 and DNL102 were passing through the Kings Cross building site in April sunshine in 2002 and 2003 respectively. 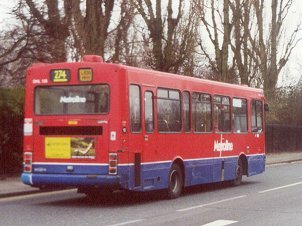 During 2003 Metroline has replaced many of its first generation Darts with new low-floor single-deckers, and the DNLs have all moved on. Ensign Bus at Purfleet took them all into dealer stock, and sold some around the country. Imperial Bus took a pair for its Essex routes, painting them green and white.But the prospect of a long-term rail replacement contract starting in January 2004, covering the closure of the Strood-Higham tunnel, with Ensignbus (the operator) as contract organiser has seen most of them prepared for this, in "Southdown" green and cream, with Ensignbus, Kings Ferry or Redroute Buses. After the contract's completion they moved on to pastures new. 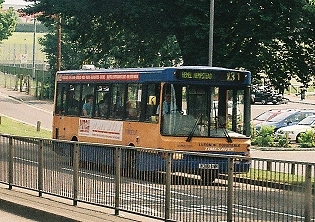 Capital Citybus bought a singleton Dart Paladin in July 1994, and put it into yellow livery. It moved north within First group in January 2002, heading deep into the West Country. Centrebus of Leicester took over the Sovereign local operations in St.Albans in January 2004, then combined forces with other operators in the Luton and Dunstable area: LQT, Refresh Solutions and Lutonian Buses. LQT contributed a pair of 9.8m Northern Counties bodied Darts. Initially in InMotion livery, they were reliveried in the combined fleet colours of orange and blue and used on the X31 service between Luton and Hemel Hempstead. They gained a large blue X31 by way of route branding on the sides. In late 2008 they received the new livery of deeper orange with a white front scoop and blue skirt, to match the new acquisitions. These were three similar buses from Huddersfield, where Centrebus had taken over Stagecoach's ex Yorkshire Traction operations. Three Paladins were moved south in August 2008 to the Dunstable operation, in the new livery. Centrebus 189 in Luton on the X31 to Hemel Hempstead, June 2007. Ian's Bus Stop Dart index. EDR. DNL. DAL.